The Brewers dropped the finale of the four-game series against the Pirates yesterday, only their fifth loss of the month. Shaun Marcum was the hard-luck loser, as he held the Pirates to two runs over six innings, but the Brewers just couldn’t get anything going on offense. Thankfully, the Dodgers finished off a sweep of the Cardinals, and the Brewers still possess a commanding ten-game lead in the NL Central. They’ve won eighteen of their August games and have just five left to play, including a series against the hated Cubs. Not to shabby for a team that started the month up only two and a half games. All of this got me reflecting on another historic Brewers August. The 2008 Brewers started August off on the wrong foot. They rode a five-game losing streak coming into the month, including a devastating four-game sweep at the hands of the Cubs at Miller Park. During that stretch, the Crew watched the division begin to slip away, dropping from one game back to five. The team’s fortunes began to turn during a 4-2 roadtrip to Atlanta and Cincinnati to begin the month. The road was pretty nice to the Brewers that August, as the team compiled a 11-6 record during visits to those cities, San Diego, Los Angeles, St. Louis, and Pittsburgh. On August 13, 2008, the Brewers broke the 70-win mark in a 7-1 win over the Padres. C.C. Sabathia was the winning pitcher, giving up nine hits in seven innings but allowing only one run to score. The Brewers rounded out their August road games in style with a sweep of the Pirates on the last day of the month. The winning pitcher? Again, C.C. 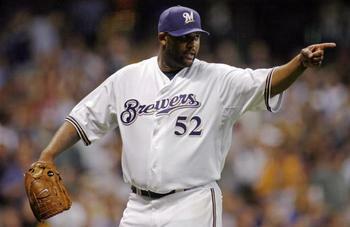 Sabathia, in what might be the most memorable one-hitter in Brewers history. With the victory, the Brewers had 80 wins on the season and sat 4.5 games behind the Chicago Cubs. Sabathia was lights out the entire month of August. He did not lose a game, compiling a 5-0 record en route to a 1.12 ERA. Sabathia struck out 51 and walked only 8, while limiting opposing hitters to .223. He also gave the bullpen some relief, throwing complete games three times, twice at home. Like their 2011 counterparts, there was no place like home for the August 2008 Brewers. Playing to sellout audiences the entire month, the Crew turned in a 9-1 home record, including sweeps of the Washington Nationals and Pittsburgh Pirates. The team ended the month with a 20-7 record, aided by Sabathia, Jeff Suppan (5-0, 3.00 ERA), and Salomon Torres (6 SV, .84 ERA). While August 2008 was one to remember, September of that year was just as forgettable. The Brewers went 10-16 that month, barely winning the NL Wild Card despite a 90-win season. The quality of the starting rotation this year should prevent the kind of September swoon the Brewers endured in 2008, though. In 2011, there’s a pretty good chance the Brewers can continue their winning ways all the way into the playoffs. This entry was posted in Uncategorized and tagged 2008 Postseason, Brewers, C.C. Sabathia, Pirates. Bookmark the permalink.